Video from the 2016 dual meet season opener where CBA extended their total to 345 against Colts Neck and Manalapan. With NJ #1 and US #10 Christian Brothers Academy set to put its remarkable national dual meet winning streak of 350 in a row on the line when it opens its season Tuesday vs. Colts Neck and Manalapan in Manalapan, this seemed like a good time to rewind the cross-country clock and take a look back at the historic run that the Colts have been on since 1974. Here's a story I wrote that was published in The Star-Ledger on Sept. 29, 2004 that looks into the anatomy of CBA's streak. Phil Shaheen had those typical prerace knots in his stomach. It was Sept. 19, 1974, and Shaheen and his teammates at Christian Brothers Academy were preparing to open their cross-country season against Marist on a damp afternoon in Lincroft. "We graduated a lot of good runners the year before, and I didn't know what to expect," said Shaheen, a senior at the time. "I was nervous because I was a captain and you want to get the season off to a good start. You don't want to start 0-1." Turns out Shaheen had no reason to worry. Christian Brothers swept the first eight places and scored a perfect 15-50 victory. And CBA has remained perfect since. 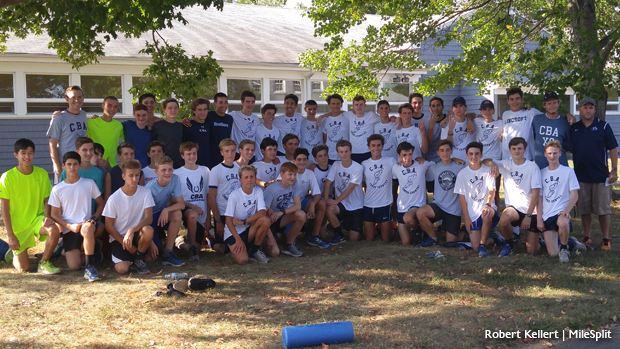 It has been 30 years since Shaheen, Al Campanella, Rich Desmond, Chris O'Brien, Sean Higgins, Pete McDonough, Jim Ansell and Jack Surgent crossed the finish line, and CBA has yet to lose a dual meet. When it beat Marlboro, 20-43, yesterday, CBA equaled the national high school record for consecutive dual meet victories with 265. And, tomorrow afternoon around 3:45, it will attempt to take the record from Blackstone-Millville Regional High of Massachusetts - which has held it for the past 12 years - when it runs against 2-0 Middletown North on CBA's Lincroft campus. "No one knew back then that a streak like this could happen," Shaheen said. "But at the same time, I'm not surprised by anything that a team coached by Tom Heath does. He took an average runner like myself and made me into something. He's been doing it ever since." Heath never ran cross-country but was a sprinter on the track team at Christian Brothers and is a 1965 graduate of the school, which he attended for one year after moving to Leonardo from the Bronx at age 16. After graduating from Montclair State, he returned to his alma mater in 1970 to accept a job as a math teacher. But when Heath interviewed for the job, he discovered there was an opening for an assistant coach for the track and cross-country teams. "I ran track, so I figured I'd give coaching a try," Heath said. "Besides, they gave me 800 bucks to do it." After one year working under head coach Dave Hyland, Heath was elevated to head coach in track and cross-country. Shaheen, 47, owns a lumber company and lives in Locust. He said he'll be at the meet tomorrow, along with other former CBA runners. "I've followed the streak in the papers, and when I saw they got to 200 a few years ago I knew they had a great shot at breaking it," said Shaheen, whose nephew, Theo Shaheen, ran for CBA last year. "Seeing the record broken brings everything full circle." Team picture from the 2016 season. The streak was expected to end on Oct. 20, 1981. That was the day state powerhouse St. John Vianney came to Lincroft as a heavy favorite to end CBA's run at 93. It was the first of four meetings - but the only dual meet - scheduled that season between CBA and St. John Vianney, coached by current Colts Neck coach Jim Schlentz. Thanks to the heroics of Ken Kolb and the late John Vickers, CBA prevailed in the greatest dual meet in CBA - and perhaps state - history. After each team had its first five runners across, the score was tied, 28-28, meaning the outcome would be decided by a sixth-runner tiebreaker. Vickers was CBA's sixth man and finished in 15:40, 16 seconds ahead of St. John Vianney's sixth, Frank Rainsford, giving CBA a dramatic, streak-saving victory. Kolb, who finished sixth overall and third for CBA, severely sprained his ankle when he stepped into a hole as he neared the finish line. After he crossed the line, an ambulance took him to the hospital. "They had the better team on paper," Kolb said. "They had faster times and more talented runners. But we were pumped to keep the streak going. I beat runners that, on paper, I shouldn't have and ran my fastest race." "There's no way we should have won," Heath said. "They killed us every other time that season (Vianney beat CBA in the Monmouth County meet, the Parochial A meet and the Eastern Championships) but Ken Kolb and John Vickers emerged as the heroes of the streak. Kolb went above and beyond his abilities for us to win. And without Vickers we couldn't have won. Kolb and Vickers are legendary and will forever be linked in CBA history." Heath said he was thinking about the national record well before the St. John Vianney showdown, especially with CBA preparing for a switch into a less-competitive division. "Twelve months before the race, I knew if we beat them we'd get the record," Heath said. "That was our only tough race in '81, and after that season we were going into A North Division of the Shore Conference." Heath took over the program from Dave Hyland in 1971. His dual-meet record is 296-7 and he has led CBA to a record 13 NJSIAA Meet of Champions titles, including six straight from 1995 through 2000, 19 Parochial A titles including the past nine, and his 1982 team holds the course record for the fastest five-man average at Holmdel Park of 16:26.2. Virtually every runner who has come through the program lists the same reason for its success. "It's Coach Heath," said Brian Kerwin, CBA's only Meet of Champions individual winner, in 1999. "He's established a system that everyone believes in. There's no second guessing someone who has done what Mr. Heath has. He's so determined, intense and passionate in what he does because he wants to make every team the best they can be. "As long as he's the coach, CBA's legacy of greatness will continue." Over the years, Heath has coached his son, Tom Jr., who was graduated in 1991, his stepson, Keith Hanson, and several brother combinations who have been instrumental during the streak. The family that has worn the most CBA uniforms is the DiChiaras, who live near the school in Lincroft. First it was Tommy, whose last cross-country season was 1996, then Joe ('97), Jeff (2000) and the most recent Nick (2005). "I was just eight years old in 1995 when I watched my brother, Tommy, run in the 200th straight win to break the state record," said Nick. "I remember Mr. Heath telling me that I'd be on the team that broke the national record. It's been on my mind ever since." With everything CBA has accomplished in Heath's years as head coach, the streak sits at the top of his list. "Winning state titles, Easterns and everything else has already been done," Heath said. "But what we're about to do has never been done. How can you top that?" Kerwin said it's easy to pinpoint why the streak is so important to the tradition of cross-country running at CBA. "Winning Parochial state titles and Meet of Champions titles are things that one single team was responsible for," Kerwin said. "The streak is something that every runner that put on a CBA uniform contributed toward. It ties everyone who has run for CBA together forever and that's what separates this from anything else we've done. "Everyone who has ever run at CBA knows about the streak. It's been the responsibility of every team to keep it going. The fact that we've kept it going for 30 years is truly amazing." • Oct. 20, 1973 - CBA lost to Raritan, which was led by current Shore Regional coach Mel Ullmeyer, 15-49. It hasn't lost since. • Sept. 19, 1974 - CBA's streak begins with a 15-50 victory over Marist. • Oct. 20, 1981 - CBA wins thrilling sixth-runner tiebreaker over St. John Vianney (coached by current Colts Neck coach Jim Schlentz) to extend the streak to 94. • Sept. 28, 2004 - CBA defeats Marlboro, 20-43, to tie Blackstone-Millville of Massachusetts for the national record for consecutive dual meet wins with 265. • Sept. 30, 2004 - CBA scores a 15-50 win over Middletown North to break the national record with its 266th victory in a row. Blackstone-Millville set the record in 1992. • Oct. 3, 2006 - CBA overcomes a 1-2 finish by Colts Neck (featuring All-American Craig Forys) to win its 281st in a row, 25-36. 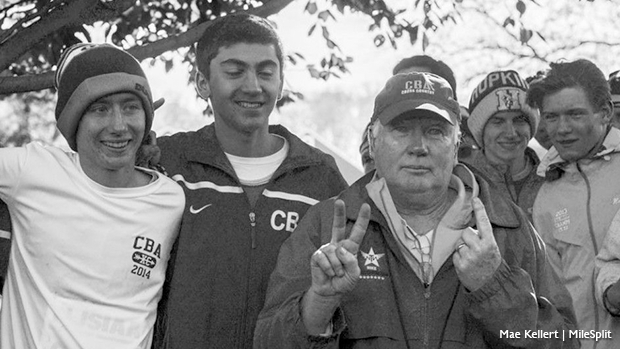 • December of 2015: CBA coach Tom Heath retires from coaching after a 45 year career. • Sept. 13, 2016, CBA, under new head coach Sean McCafferty, edged Colts Neck, 27-32, and defeated Manalapan 15-50 while averaging a course record 14:50.6 in Lincroft to extend its national record to 345 in a row.